Before, this New Haven attic had insufficient insulation, causing uneven temperatures throughout the home and higher energy bills. Wanting a more energy efficient home, the homeowner contacted the experts at Dr. Energy Saver of Connecticut. Now, the attic is completely insulated with SilverGlo. SilverGlo was the perfect solution for this attic because this insulation is durable, waterproof, and won’t shrink or lose R-value over time! Also, it has an integral radiant barrier to reflect summer heat out and winter heat back in. This is exactly what the homeowner wanted and they were very pleased with the results – an energy efficient home with lower energy bills! Insufficient insulation in attic. Potential wet insulation. I have a few inches of old blown insulation in my attic and want to increase it to recommended amount. Looking for quote on installation of cellulose wall insulation. Even though your company previously performed services in the attic and basement of my residence, I think there is an additional need for wall insulation. I had a pipe bust in my basement two weeks ago. The pipe was fixed but the water damaged my insulation and needs to be repaired. He was in my attic and said that the insulation is installed all wrong and will shorten the life of my roof. Also said that I didn't have insulation in the walls in the part of the wall where they were working. Quote for adding insulation to attic. "Extremely polite and explained each step as they worked"
Here at Dr. Energy Saver Of Connecticut, we believe in the value of customer service and are proud to serve our area. We use only high quality products, installed by our excellent team of certified technicians so that you can be sure of long-lasting results. We want to work with you to find the solution that will work best for you! Homes often leak energy through attics that are ineffectively insulated which can cause homeowners to pay more than they need to for their energy bills. Attics take in heat that rises from the rest of the house if they are poorly insulated, causing the rest of your home to be uncomfortably too hot or too cold. This can be remedied by installing our SuperAttic system which is proven to eliminate air leaks through the attic. There are different advantages to both spray foam and rigid insulation, though spray foam is more suited for attic insulation. Spray foam can provide both insulation and air sealing while and can expand to fill in gaps and cracks, though it can be messy to install. Rigid insulation, like SilverGlo, is used more commonly in insulating crawl spaces and basements because you can easily cut it to fit a shape. The downside to it is that it does not account for small cracks and it takes longer to install. If your home isn't air sealed, then its almost the same as keeping a window open in the winter, letting all the heat escape. What frequently happens in homes is what is called the "stack effect" what happens with this is warm air leaks up through the floors into the attic and is then released outside. Then more air from the basement and crawl spaces is allowed up through the house, making your home uncomfortably cold. Our trained technicians are skilled at pinpointing which areas of your home are the major culprits of air leaks and fixing them so that your home can be more energy-efficient. Crawl spaces are one of the other areas where energy is leaked, due in part to their general location in the home. When a crawl space is inadequately insulated, it lets bad air into the home. One of the major problems with homes that have insufficient insulation in their attic is that when the heat escapes in the winter time, it melts the snow on the roof. The melted snow then freezes again in the gutter and over time, the buildup causes water to get dammed up and then leak back through the shingles of the roof. 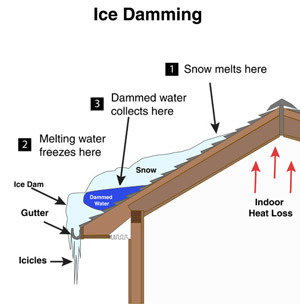 The best way to prevent ice damming is to insulate the attic so that heat cannot escape through the roof in the first place, eliminating the problem. Windows are one of the places that many people do think of as a risk factor for air leakage in the home. Cracks and gaps around windows and doors can be as detrimental an air leakage as leaving a window completely open. The way to remedy this issue is to replace old windows with insulated ones, more well-fitted to the space the windows occupy so that air cannot get through cracks and cause you to unnecessarily pay high energy bills. Dr. Energy Saver Of Connecticut has the tools and the professional expertise to get your job done. Our team of friendly, knowledgeable staff use only high quality materials and methods that are proven to make your home more energy-efficient and save you money. Call us today for a free estimate! This is how the SilverGlo looks when it is completely installed. It will keep the attic running efficiently, exactly as the homeowner wanted! 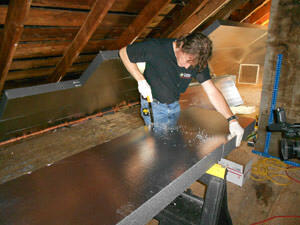 SilverGlo was the superior choice for this attic. It has a higher R-value than traditional batt insulation and will not support mold growth. The SilverGlo insulation panels need to be measured correctly to ensure accurate placement. Would like energy assessment - where we are losing the most heat. Hello! We are looking at insulating our walls in our home. Have poor insulation.Need a quote for spray foam the entire house. Advice on, or a quote for, work on an Attic floor (warmer in winter, and, if possible, cooler in summer). Wine cellar (or cabinet) in basement. There is an airconditioning unit in the cellar, which cannot keep the space cool enough in 90+ degree weather. I want to install a professional wine cellar refrigeration appliance, but for that to work, the space needs to be better insulated and vapor-sealed.